OLPRO are fast becoming renowned for their high quality but affordable chemical and cleaning products for caravans and motorhomes, including Winter Long Protection. They have now launched three new products aimed at prolonging the life of your tent canvas, keeping your tent clean and keeping you clean! They all come in handy 500 ml bottles and all are available direct from the online OLPRO shop and each currently costs just £7.99 plus delivery. Win them all! OLPRO Spray & Proof is ideal for all waterproofed garments, tents, and awnings. 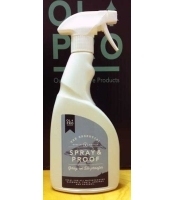 It's a fantastic spray on, water based proofer, which works quickly to waterproof tents and other objects which may have lost some of their effectiveness or just need a top up, or to waterproof new products. Spray & Proof is an essential product to keep in the car for any camping trip. Can also be used on coats, trousers etc if the waterproofness of the product has diminished. Concentrated Travel Wash for use on clothes whilst away from home. 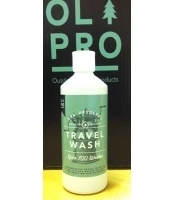 OLPRO Travel Wash contains no bleach and is safe to use on all fabrics including delicates. It's fragrant smell gives all clothing that just washed feel and smell. Works in hot and cold water and even works in sea water. Now you can have clean clothes where ever you are. Use only 2 caps for manual washing so you will get up to 100 washes per bottle. OLPRO Wash & Proof adds to or reinvigorates the waterproofness of all fabrics. 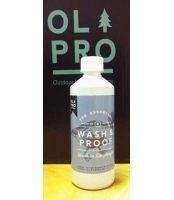 OLPRO Wash & Proof revives breathable clothing and is easy to apply. Just one wash in the washing machine or by hand prolongs the life of your clothing. Ensure you're ready for the Great British Outdoors with Wash & Proof. You can place and order for any of these products online on the OLPRO website, for delivery direct to you by courier within 3 working days. All prices correct at the time of publication. Win one of two Prizes containing all these products! 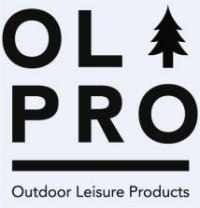 We have teamed up with OLPRO and are offering you the chance to win one of 2 packs each containing a 500ml Travel Wash, 500ml Spray & Proof, 500ml wash in re-proofer and a 1-litre bottle of Winter Long, worth £32 each. To find out more and for your chance to win click here , Competition now closed! Two really attractive new windbreaks from OLPro. The Witley comes in 5 pole 12 foot, and a 7 pole 18 foot wide versions. Complete with awning channel. Find out more, buy online, and even get the chance to win one! Please also see our Tent Showcase which has thousands of tent reviews and photos from all the popular manufacturers, with photos, reviews and more. Leave a review for your tent for a chance to prizes! Plus : Upload your own tent photos.